Apple and Miso Tofu with a Pumpkin, Curried Citrus Dressing. This was dinner tonight. 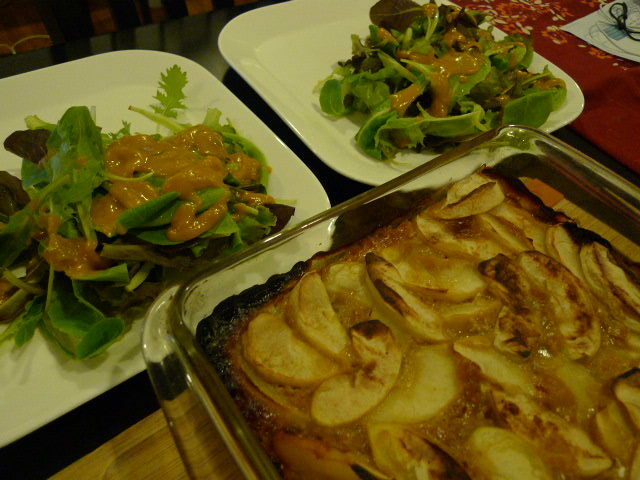 The tofu (hidden underneath the apple) was baked in a sauce with mirin, miso, soy sauce and other flavourful delights. The green salad is just a mixed green one from a bag and over the top is a pumpkin curried citrus dressing which was very low calorie yet really rich. No added fat in the dressing, infact the whole meal had no added fat in it!